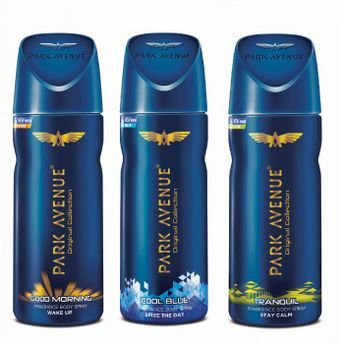 Accentuate your confidence and make it last throughout the day with Park Avenue Body Deodorants - Buy 2 Get 1 Free Offer! Park Avenue Men's Classic Deo Good Morning is an enigmatic body spray that comes with fine Gourmand accords which will give a perfect start to your day. Good Morning is a fresh blend of citrusy mandarin and bergamot, which helps start your day on a refreshing note. It's a mix of sweet vanilla fragrance with guinea tonkabeans that keeps you fresh all through the day.Start every day on a fresh note with this deodorant spray from Park Avenue. Park Avenue Men's Classic Deo Cool Blue opens with an oceanic cool fresh note and is powered by a combination of spicy-clove and citrusy lemon. Its nice fruity heart blended with a heavy woody character ensures that the fragrance stays for a long time on your body. Calm like the ocean, cool like the icy mountain breeze, Park Avenue Men's Classic Deo Tranquil relaxes your senses with its serene tranquillity. Tranquil has fresh notes - cologne and aromatic, blended with nutmeg, cardamom and other spices, that give it a refreshing and soothing feel. Its fresh patchouli, heavy ambery and woody base blend helps it hold the fragrance for a long time.The dry, wooden base note adds a touch of masculine sophistication, transporting you to a land of magical kingdom of nirvana.